I was supposed to be enjoying a TV show with the mister but my mind was elsewhere. I was thinking about Peanut, our 11-year-old pug, and our ongoing dilemma of how to make going potty outside in the wintertime easier on all of us. Because our little gal insists on finding the perfect spot on which to conduct business, she often takes so long that her little pads get too cold and she gives up the quest before completing the job. 1. Long rolls of plastic grass over scented wee wee pads. I ordered an approximate 5′ x 7′ roll of outdoor synthetic grass that I was sure would be a home run for use during inclement weather. I was going to trick Peanut into thinking grass magically appeared in the middle of the basement, thus making potty inside acceptable. She refused to step on it indoors and skipped right over it outside, conveniently placed over the snow. This may have worked had we started it years ago. 2. Large tent outside to block wind, rain, and snow. While the tent is plenty large enough for Peanut to trot around inside and select from a number of fine spots, my impression is that the tent walls make her feel like she is still indoors, and she knows that good girls go potty outside. Anyone in the market for a bottomless tent? 3. Boots Each brand that we’ve tried (and we’ve tried A LOT) rotates around on her paws when she walks, causing her to trip and stumble. 4. Dog litter box Again, this may have worked if she was initially trained this way. It basically became a treat box–jump in, get a treat, jump back out and wait by the door to go potty outside. Last year we had some success using Top Paw dog socks. They are rather thin and not waterproof, but they afford a few extra precious moments that m’lady requires when trotting around on frozen ground in search of that perfect spot. The problem with the socks is that they fall off at least 50% of the time, necessitating us to go on sock-finding missions in the snow and muddy grass. In an “if only there was a way to keep socks attached like mittens” train of thought, it occurred to me that I could try to keep the socks attached with mitten clips for children. Why not? Since I insist that our little pumpkin wears a coat* to cover her belly, it made sense that I could clip the socks to the coat. I’m not sure if we would ever need the socks without the coat, but while mulling over what else we could do to reduce everyone’s stress, I had a vision of body-length elastics with clips for socks or boots. Ah HA! Doggie suspenders! I don’t recall ever seeing such a product in stores. Surely I would have noticed something like that to help solve our dilemma. Completely impressed with myself, I was already envisioning fabrics, designs, and the most darling photos of Peanut on the little tags. With a flutter of excitement in my heart, I just knew that I was going to set the canine clothing and accessories world on fire! …until the next morning when a simple Google search revealed that such suspenders already exist. Apparently others had this same wonderful vision and were able to execute their vision long before I. Good for them, shucks for me. Instead of clipping and unclipping all four socks each time I need them on her, I leave everything attached to the coat. The coat goes on first, then I bunch up the sock (already attached to the clip and coat), place quickly under the paw, then pull up or roll up the leg. I keep another coat handy for the times we don’t need the socks. 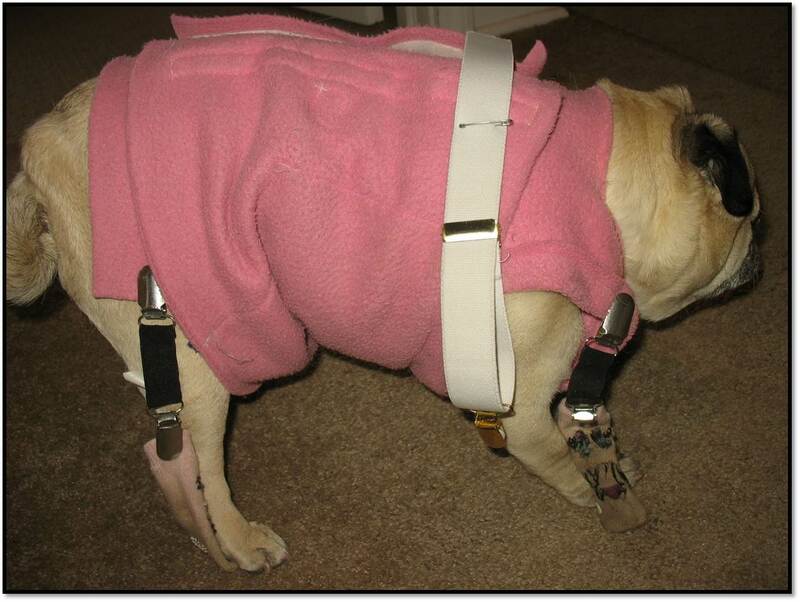 Over time, and before we came up with the potty tent, we needed to supplement the resistance on Peanut’s right front leg. Because she has such a weak wrist, she would bend and drag off the sock. Resistance from either side helped keep her from walking out of the sock. However, we no longer use any socks since creating the outdoor tent. Mitten clips not long enough for your bestie? Try cutting up a pair of suspenders and simply pin the straps to the coat. It’s easy to adjust the length of the strap required for the right resistance without any additional cutting. *My homemade coat (pictured above) is another idea I cooked up since not only was it a challenge to find a coat that covered the entire belly, it was, and still is, downright impossible to buy off the rack for the petite and barrel-chested. The addition about the dog coat has moved. I’ve added those details and more here. ← My Kind of Courtship! Oh brilliant! How, pray tell, did you convert the sweatshirt (my assumption) into a coat? We are trying to figure a way to do this, because you are so right,..we have a drawerful (or 3!) of I’ll-fitting clothes for her highness, and several for the little prince. You’d think someone would have a line just for pugs (and maybe Boston’s, Frenchies, etc). We’ve tried boots too, without success, but the socks are a good idea. Thanks! Great post i will share if you don’t mind. I used basic fleece purchased from a craft store off-the-bolt as well as large remnants at even further reduced prices (approx. $5-$10). The fabric is warm, easy to cut, and retains its shape pretty well so that I don’t have to account for a hem (I did however reinforce the neck with extra stitching so it doesn’t get too stretched out). I also added extra fabric to the belly because if I were Peanut, who has hardly any fur her tummy, I’d want an extra layer. 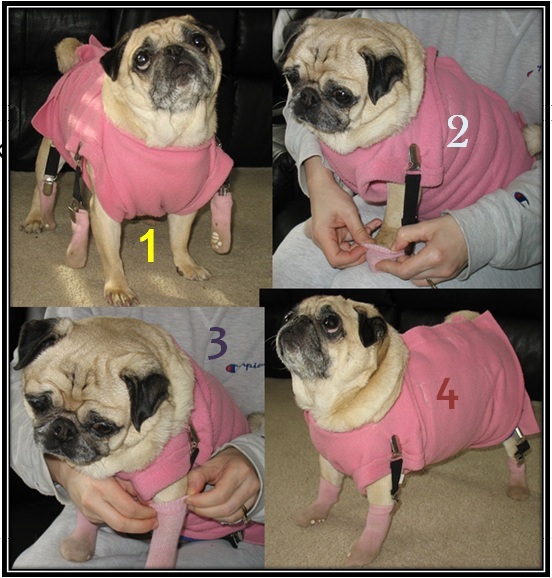 I include the basic measurements as shown for Peanut who is rather petite for a pug. What is nice about the pattern and Velcro is that you don’t need to be exact. The fabric is accommodating enough to comfortably bunch up a bit or stretch if necessary and the Velcro pattern allows for variation when fastening up a fussy friend that doesn’t want to cooperate. Good luck and I hope this or something similar works out for you too! Excellent! Thanks so much for posting the pattern. I showed it to my partner, who has a sewing machine and can see fairly well. She is optimistic, so we’ll give it a go, and I’ll let you know how it turns out.